Ref. 4737 So-Called "Yellow Cioccolatone" Vacheron & Constantin, Genève, "Automatic", No. 527759, case No. 352716, Ref. 4737. Made in 1956. 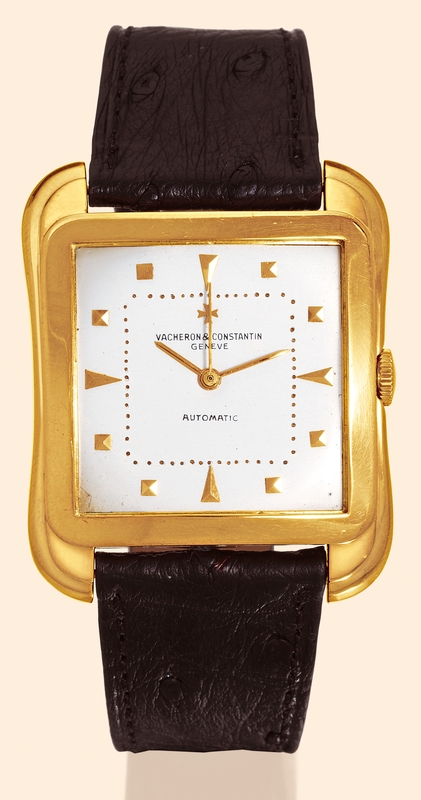 Very fine and rare, large, "carré", center seconds, self-winding, 18K yellow gold gentleman's wristwatch. C. Two-body, solid, polished and brushed, stepped bezel, rounded lugs, domed thick crystal. D. Silver with applied yellow gold pyramidal and dart indexes. Yellow gold "baton" hands. M. Cal.P1019/1, rhodium plated, "fausses-côtes" decoration, 21 jewels, straight line lever escapement, beryllium balance with timing screws, adjusted to temperatures, shock absorber, selfcompensating Breguet balance-spring, swan-neck micrometer regulator. Dial, case and movement signed. Dim. 35 x 43 mm. Thickness: 12 mm. C. Two-body, solid, polished and brushed, stepped bezel, rounded lugs, domed thick crystal. D. Silver with applied yellow gold pyramidal and dart indexes. Yellow gold "baton" hands. M. Cal.P1019/1, rhodium plated, "fausses-côtes" decoration, 21 jewels, straight line lever escapement, beryllium balance with timing screws, adjusted to temperatures, shock absorber, selfcompensating Breguet balance-spring, swan-neck micrometer regulator. Dial, case and movement signed. Dim. 35 x 43 mm. Thickness: 12 mm. Ref. 4737 is called ?Cioccolatone? by Italian collectors due to its shape. Several variatons exist: the self-winding Ref. 4764 with calendar and moon phases; Ref. 6440 with center seconds; Ref. 6440Q, with date. These models are the most admired and sought-after wristwatches of the 1950s. Vacheron Constantin, always innovative, was clearly ahead of its time in offering a model so unusual in size and shape. Particularly pleasing was the rounded outline of the case, with its superimposed ?levels?. At the time, it was made in yellow gold, more rarely in pink gold, and only two examples in white gold. It was reintroduced as of 2003 with a guilloche dial and a platinum case and was launched under the name ?Toledo?.